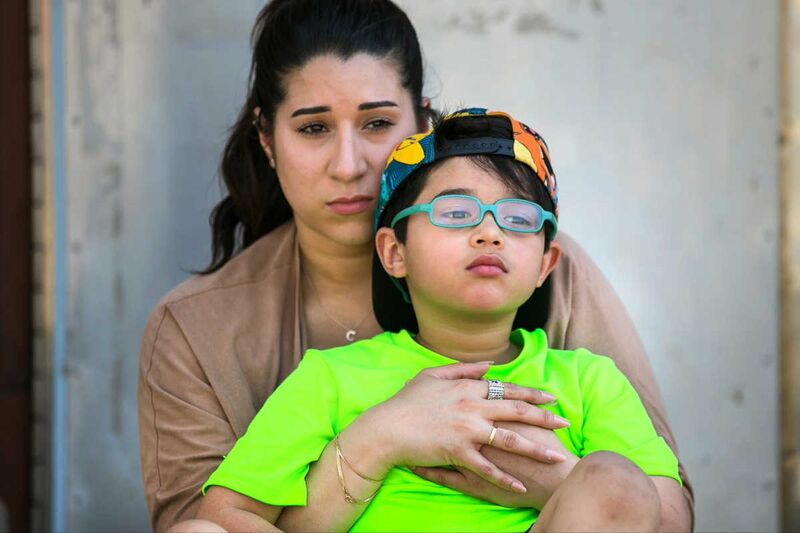 Cristine Gonzalez, back, held her son Dean Pagan, in May, 2018 at a playground in Philadelphia. Dean was severely lead poisoned at Comly Elementary School. The Philadelphia Inquirer’s “Toxic City” investigation, a series that combined both innovative and old-fashioned reporting methods to expose unhealthy environmental conditions affecting children, resulting in changes in how schools handle hazards, was a finalist in the 2019 Pulitzer Prizes announced Monday. The stories, by journalists Barbara Laker, Wendy Ruderman, Dylan Purcell and Jessica Griffin, depicted the ongoing struggle to protect Philadelphia children — many poor and minority — from environmental harm. Reporters examined lead paint in old homes, contaminated soil in once-industrial neighborhoods, and unhealthy conditions in public schools that made children sick. All three of the “Toxic City” reporters are winners of Pulitzer Prizes for previous stories. The series has had profound impact. As a result of the stories, Philadelphia passed a law that for the first time requires public schools to certify they are “lead safe” every year. Schools must also be subject to outside inspections, potential fines for persistent violations, and mandatory cleanup deadlines. The Philadelphia School District also began cleaning up asbestos fibers in seven of the worst schools. In addition, Gov. Tom Wolf announced that $15.7 million will be used for emergency cleanup to repair shedding lead paint in 40 schools, which affects about 29,000 children. And, Wolf announced a plan to spend $100 million in Philadelphia public schools to clean up lead, asbestos, and other hazards — an effort, he said, that’s a direct result of the series. In an unusual and innovative effort, the “Toxic City” reporters recruited and trained staffers in schools to test buildings for lead in water, lead paint, and other hazards in areas where reporters were not allowed to go. Reporters also took pains to track down and speak with families whose children were affected by deteriorating school conditions. The three-part “Toxic City” series has won multiple awards. “It is a testament to the reporters’ range that their work was honored by contest judges rewarding the best in journalism for widely different reasons: innovation, data analysis, local accountability, and impact,” said James Neff, deputy managing editor for investigations. “Toxic City” was supported by funding from the Lenfest Institute for Journalism, the USC Center for Health Journalism, and the Dennis A. Hunt Fund for Health Journalism. Winner of the Pulitzer for local reporting was The Advocate of Baton Rouge, La. for articles about unequal justice for African Americans.